A perfect mix of good ingredients and naughty ingredients. It starts with a beautiful croissant, toasted. Between it’s buttery and flaky layers is some crisply fried canned corned beef hash, topped by a perfectly cooked over easy egg sprinkled with kosher salt and freshly cracked black pepper then topped off by canned sharp Cheddar Cheese. 1. Split the croissant in half and toast. 2. Heat a non stick pan over medium high heat, add the corned beef hash. Cook the has until it is brown and crisp on one side (3 to 5 minutes), then flip with a turner and cook the other side until it is crisps and browns, another 3 to 5 minutes. Note: While cooking the hash, push it together and flatten it so it makes a little patty, it’s much easier to flip and serve that way. Place the corned beef hash patty on the bottom half of the toasted croissant. 3. In the same pan, melt the butter and add the egg, fry according to taste. Sprinkle the egg with a little salt and pepper and place on top of the corned beef hash patty. 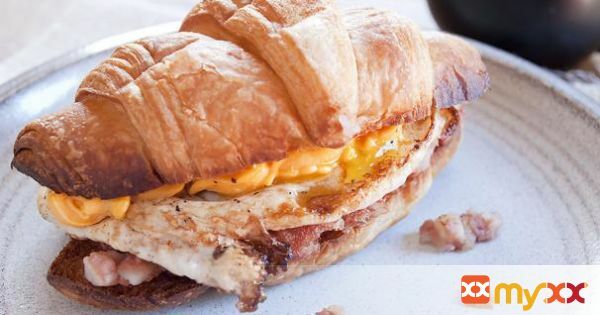 On the top side of the croissant, squeeze a layer of canned cheese over it. Place the top layer over the bottom half. Serve immediately.